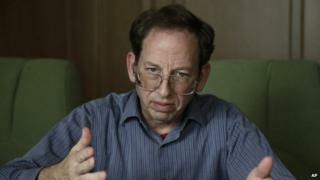 Jeffrey Fowle, one of three US citizens detained in North Korea, has been released, US officials say. State department spokeswoman Marie Harf confirmed that Mr Fowle was on his way home on Tuesday following negotiations. She said the US was working to secure the release of two other US nationals, Matthew Miller and Kenneth Bae, who remain in detention in North Korea. Mr Fowle, 56, entered North Korea on 29 April and was detained in early June as he was leaving the country. He was charged with "anti-state" crimes. He was reported to have left a Bible in the toilet of a restaurant in the northern port city of Chongjin but his family have insisted that he was not on a mission for his church. In August, he and fellow detainee Matthew Miller made a televised appeal to the US government to help secure their release. Responding to the appeal, the US authorities vowed to make securing the release of the detainees a "top priority". Mr Miller was later sentenced to six years' hard labour for committing "hostile acts". The state department's Marie Harf said Washington welcomed Mr Fowle's release, adding that US officials "remain focused on the continued detention of Kenneth Bae and Matthew Miller and again call on the DPRK [North Korea] to immediately release them". She also thanked Sweden, which serves as the US protecting power in North Korea, for the "tireless efforts" of its embassy in Pyongyang. No reason was given for Mr Fowle's release. Washington has been trying to send high-level representatives to negotiate the detainees' release, but these visits have been cancelled by North Korea in recent months. Pyongyang has denied accusations that it is using the arrested Americans as diplomatic bargaining chips.